First held in August 8, 2010, the first ever convention in the Philippines celebrating Filipinos fandom to Korean popular music, fashion and culture hit success and have gathered almost 5,000 attendees filling Megatrade Hall 1 of SM Megamall almost to its capacity. Since then, and because for its unique character and innovative segments, K-POP AND CULTURE FEST became the biggest Hallyu Festival celebrated in the Philippines. KPOP AND CULTURE FEST is organized by KFEST Manila Events Management, who also brought a successful series of Korean Pop Culture Events in the country promoting Korean Culture Awareness and Influence. This colorful and exciting festival is not only an opportunity to fans to enjoy their fandom by purchasing K-Pop merchandise or taking part in exciting competitions, it's also a chance to connect and make friends making it an edifying celebration of cultural exchange and diversity, as well as a fun, exciting event of good music and rich culture affirming cultural closeness between the two countries. 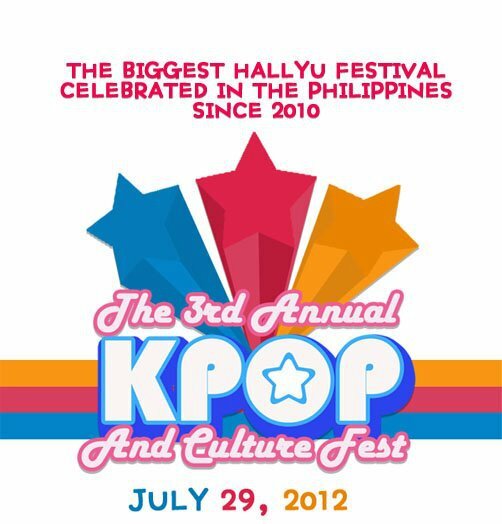 On July 29, 2012, from the team that brought you the most attended and biggest K-POP event of 2011—KPOP NATION and the only Hallyu Cosplay themed event in the world—KFEST Cosplay Convention, will bring you again, on its 3rd year, the biggest Hallyu Festival celebrated in the country—KPOP AND CULTURE FEST 3. Happening in Megatrade Hall 2, SM Megamall from 10AM – 9PM.